The Way of the World, Donmar Warehouse. Photo: Johan Persson. Often the challenge with restoration comedies is finding a suitable register for a contemporary audience. William Congreve’s The Way of the World was first performed in 1700 and is full of the typical witticisms and windy storytelling of the era. At the Donmar, James Macdonald’s smart revival finds a clever balance between a full period piece and a self-conscious reflection on the genre, one that enables some outstanding performances and offers clear and enjoyable storytelling. Anna Fleischle’s design is simple but effective, surrounded in act breaks by a translucent scrim representing the walls of Lady Wishfort’s home. The pared-down set allows the characters to flourish, as do the period costumes with just a hint of anachronistic flair. That seems to be Macdonald’s vision for the production, to focus in with a fine tip on the knotty and naughty complexities of Congreve’s script and its equally developed characters. 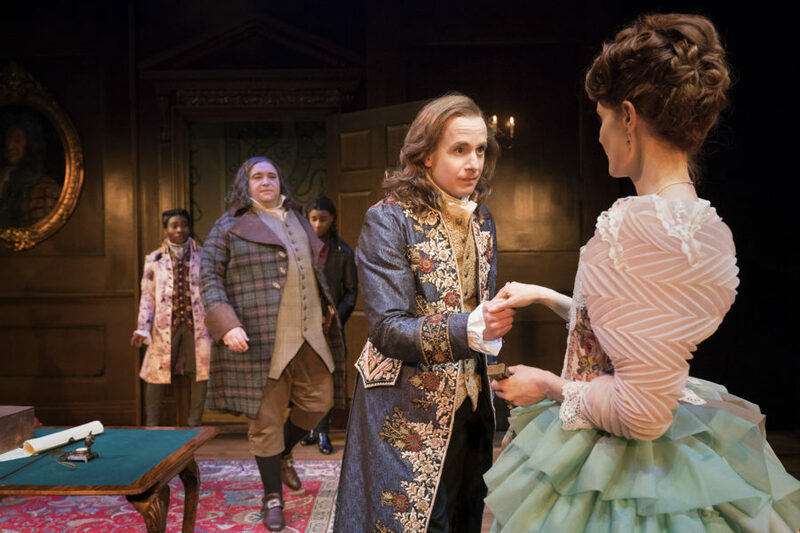 It centers on Mirabell (Geoffrey Streatfield) and his goal of not only marrying Millamant (Justine Mitchell), but also receiving her full dowry by approval of Millamant’s aunt Lady Wishfort (Haydn Gwynne). In what is likely the most famous scene of the play, Millamant and Mirabell define the terms of their engagement before they agree to be wed. Essentially pre-nups, their material goals for marriage are privileged above declarations of romantic love. Yet both Streatfield and Mitchell are canny in this scene, slyly testing out their conditions, seeing each other’s reaction, and demonstrating that their demands are as much provocations as they are proclamations. They are quite clearly enamoured with each other. In general, Mitchell is exceptional as she creates a shrewd and perceptive Millamant. At all times astutely aware of subtext and context, she stretches and bend her words, guffaws and groans, and expresses Millamant’s undeniable awareness of the absurdism that abounds, even while admitting her key role in the folly. What stands out most in Macdonald’s production are the performances, particularly from the women. Haydn Gwynne as Lady Wishfort brings most of the laughs with a sparkling and magnetic performance. Lady Wishfort’s delusion and impatience are portrayed by Gwynne with surprising heart, originating in a self-consciousness that makes her endearing and relatable. And Sarah Hadland is a treat as Lady Wishfort’s servant Foible. At times the expositional burden of Congreve’s script hampers the energy and slows the pace of the three-hour evening. One of the most compelling characters, Mrs Fainall, sharply played by Caroline Martin, ends up somewhat adrift in the twists and turns. Even with Martin’s nuanced performance, her entanglement feels somewhat overlooked. Nevertheless, Macdonald’s production is richly developed. Smartly pitched and with excellent performances, it’s a sound and thoroughly entertaining version of Congreve’s discerning comedy. The Way of the World is at the Donmar Warehouse until May 26th. For more details, click here.